So I'm very excited because Colin's new cage arrived today! He's not getting it until his birthday (which is next week) and I've had some time to sort it out properly for him - I definitely plan to do a proper review then, but this is just a first thoughts review before I start planning and forgot what I thought when I first set it up! Overall thought is that its huge - we've got a Mouse Mansion! The floorprint of the cage is longer but slightly narrower then his current cage, but its about 3 times the height at a rough estimate! It has wooden levels which are quite easy to put in, but might be difficult to take out, but I think I'll get the hang of it pretty quickly. The cage part comes ready assembled - you just have to put the levels in. It has 3 small doors on the side to access each level and then one massive door on the top. The doors are a pretty good size and close well so I don't have any fear of an escape there! That sits on a plastic base (which I plan to put his usual amount of bedding in) and has two clips to hold it down. Two handles to help lift the cage are also provided as its very awkward otherwise! The bar spacing is small - Colin won't be able to escape! I've read reviews that say that even baby mice haven't escaped from here. Its supplied with a wooden house, 2 ramps to access the upper floors, 2 wooden log tunnels, a wooden see-saw and a large wheel. The house looks great, slots together easily, reviews I've seen recommend soaking the roof to remove excess dye so I'll be doing that. Its pet-safe dye, but I'd prefer to do that anyway. The ramps are made from the same wood as the base and look durable, they fit easily into the slots provided, although I discovered that its easier to put the ramp for the bottom level in the base, put the cage on then put the ramp in place using the small door. The bottom ramp looks very steep currently but with a bit of bedding in the bottom and a toy to rest it on I'm pretty sure it'll be fine. If its not then I'll just lower the level. I'm not so enthused with the wheel and I couldn't get it to fit onto the bars, but seeing as Colin has a nice wheel already we'll be keeping that one. The wheel is a comfort wheel AND big enough for a mouse which is good! The middle level will probably be hard to put big toys into so I'm thinking of making that into a tube/box maze, but I'll see how it goes when I start to fill it up with toys! So yeah. That's my first opinion of this cage - Right now I would definitely recommend it for the UK members. I'll do a follow-up in a week or so time when I've set it all up and Colin's had a chance to play. Wondering whether to do a cage tour video at some point...does anyone have any experience of doing these...any tips? I've got a decent video setting on my camera so that's not a problem, I've just never done one! Colin is going to be living the high life soon - Mouse Mansion, sounds luxurious! Edited to add this photo of it set up straight out the box, no bedding or anything done to it, wheel just laid in the base and not attached (excuse the stuff round it, I haven't fully tidied round it yet! Beautiful! What a great find. Does it have doors on every level? Yep, its got a small door for each level - big enough for accessing everywhere on that level - although the bottom level is the hardest to get everywhere. And one large door on the top. I'm super pleased with it so far - was easy to set up and last night I made a couple of climbing walls for the bottom level which went much better than I expected! Its a European Cage so wouldn't recommend the shipping to the US but I'd recommend it if you're looking for a large cage and you're somewhere with affordable shipping! Boy, any time one of you UK mouse parents gets a new cage, we all drool here in the US ! At the risk of making you all drool more...I've written a slightly more complete review (in case it proves useful to anyone) after having set it up and taken it apart a couple of times now. I've also done a cage tour video so you can see how I've set it up this week! Sorry for the long post! A large, 3 level mouse cage. Total size is 67 cm (26 1/4 inches) length, 36.5 cm (14 1/4 inches) width and 65 cm (25 1/2 inches) height. The bar spacing is 6.72 mm (1/4 inch) - Colin definitely can't escape. Other reviews have said that baby mice haven't escaped either. A large door on the top that is 38 cm (15 inches) by 28 cm (11 inches) and 3 smaller doors on the side, each 10 cm (4 inches) by 12 cm (4 3/4 inches). Comes with 2 wooden floors, 2 solid wooden ladders (more like ramps), 1 house with a red roof, 1 blue, plastic 19 cm (7 1/2 inch) exercise wheel, 2 wood log tunnels and 1 seesaw. Also supplied are clips to hold the metal cage part to the plastic base and 2 plastic handles for carrying. Price: RPP is £80, but I got it in a sale for £55, free shipping. The cage was very easy to put together. It has two wooden levels which are held in by the means of metal pegs which push into the side of shelf on both long sides. This can be fiddly and I found the use of pliers to push down helped enormously as the pegs are very snug in their holes. The top metal cage part sits on top of a plastic base which has slots to hold the top part in place. The top is secured by two plastic clips which hold it down securely. It is trickier to take the levels out - I recommend the use of pliers to pull the pegs out! The shelves can be placed at any height you wish, but be aware of where the doors are! I found it helpful to put the ladders in the section they are intended for at this point too otherwise they are hard to get in. If you put the shelves in level with the bottom of the doors, then the ramp between the base and the first shelf is rather steep. I found it helpful to place the end of the ramp on a toy so that it is less steep. If you want to put the wheel on one of the shelf levels then I recommend deciding this first as it determine where your shelves need to be positioned. 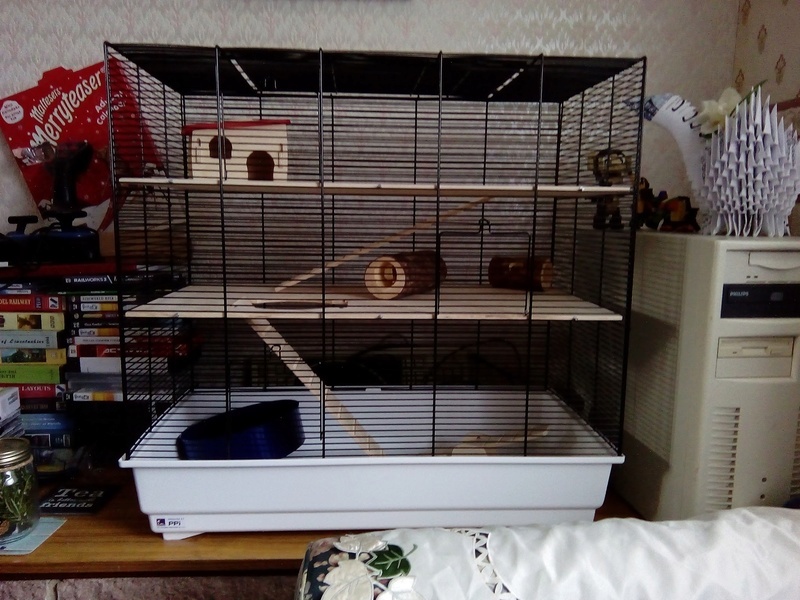 I recommend filling the bottom level with bedding and larger toys before attaching the cage to the base as it would be hard to get them in otherwise. The middle area I would recommend for smaller toys as getting larger ones through the door is tricky! The top area is great for hanging toys and is easily filled with large toys due to the large top door. The cage can be lifted using the two handles provided. These just hook on as and when you need them. The cage is heavy so I recommend setting it up as much as possible where you intend to keep it. I coated the shelves in Plasti-Kote fast dry enamel (clear colour, brush on version, purchased from amazon.co.uk) to help them last longer as I was concerned about them soaking in urine and then smelling and being hard to clean. When I set it up I also cover the shelves in paper to soak up any urine. I also painted the top of the ladders, simply because I had excess paint. It'll do Colin no harm and they'll be easier to clean. The cage has good access. The three smaller doors to access each floor which is the perfect size for getting your hand in and getting your mouse out from most areas of the cage. On the top is a large door which is very handy for putting toys in. House with Red Roof - I like this house, Colin also does - I filled it with tissue and its his current nest! There is a lot of excess dye in the roof so I followed recommendations to soak it before use. (It did colour the water impressively, soaked it in boiling water which I let cool down naturally). It slots together easily, and comes with instructions in case you can't work it out. Exercise Wheel - I wasn't overally enthused by this wheel. It has the air of a basic cheap plastic wheel. It is however a good size. Personally, I'm not a fan of the dark blue colour and I also found it difficult to attach to the bars. We'll be using Colin's free-standing wheel as it is nicer and has the bonus of being clear so we can see him running no matter where we put it! Log Tunnels - These are lovely. The holes would be too small for anything other than a mouse, or possibly a dwarf hamster but Colin loves his tunnels so these were perfect for him! Seesaw - Nicely built, slots together easily. Downside (at least for Colin) is that it has no resistance to weight so moves quickly when he walks over it and he doesn't like this. Some mice or hamsters probably would, but sadly not Colin! He does like to run around and under it though, so its still a good toy, just not in the intended way! I love this cage. Its got loads of space and is well built. It's easy to fill with plenty of toys, comes with some great accessories and an all round great cage for mice! It also seems a great cage for its price too compared to some! That cage looks awesome! I love how you've set it up with all the toys. Colin is one lucky little mouse! Those origami mice are cute too. What an amazing cage! Colin is a spoiled little guy! Once again I stand in complete awe of these Leon cages: the size and flexible layout are simply amazing! Whoever designed these actually understands the needs of small rodents and their parents. Ee, that's terrific!! How hard is it going to be to keep up with all the toys you can fit in there? What a lucky boy! Its smaller in height but a huge footprint - the huge footprint is what put us off it! @MesaMouse - I agree entirely - this cage is designed so well for both animals and parents! I'm definitely looking forward to more flexibility than his last home - one plan I have is to only put one shelf in and have basically a large climbing area on that level...not too high though, I don't want him to fall and get hurt! Yeah...this might be a cage that mice get upgraded to once they're at least a little bit tame and willing to visit me! @Peachy - I don't think its going to be too hard to keep up with all the toys. Apart from his food areas, he's generally a pretty tidy mouse and doesn't chew up all the toys. He does pee on a lot of them, but not obsessively so I very rarely have to throw toys away, just enough so he knows its his. And the ones that are disgusting have normally fallen apart first! The only things we go through lots of are eggboxes. He likes to chew up and mark those more than anything - hence why he's got two now he's got the space! good lord, what a set up! Colin is a lucky mouse! Hi Stephlisa, I was googling this cage and it sent me to this thread! I'm wondering how the cage (and more specifically, the Plasti-kote coated levels) were holding up nearly a year on?